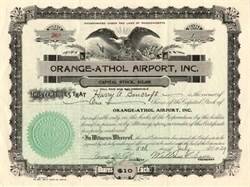 Beautiful historic certificate from the Orange-Athol Airport, Inc. issued in 1929. This historic document has an ornate border around it with a vignette of an eagle. This item is hand signed by the Company's President, William F. Cass and Secretary and is over 76 years old. The Orange Municipal Airport is the largest airport in Franklin County. The airport was built in 1929 as the Orange-Athol Airport. The airport has two active runways and one inactive runway. During World War II, the airport was significantly upgraded for potential military use. The triangular runway is a remnant of its military designed upgrade. The airport�s two primary runways are Runway 01-19, and the airport�s crosswind runway is Runway 14-32. Both runways are 5,000 feet long, 75 feet wide, and hard surfaced.